Yesterday, I provided my commentary on who I believe will take home the Australian Open Men’s Single title this year. Is it really a surprise that I chose Roger Federer? I guess not, but he really shows his stuff in the Slams. Serena Williams not only ended the year number one, but also demolished her opponents in the year-ending event, winning all of her matches. 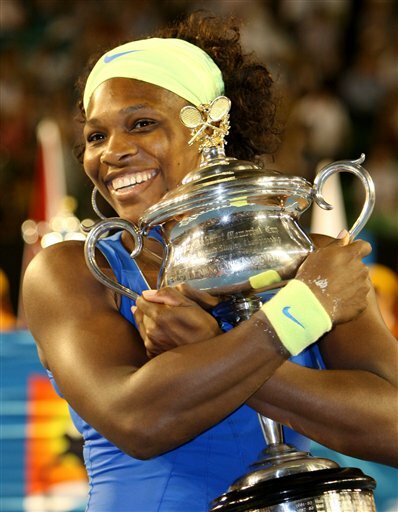 I predict that this Williams sister will continue her winning streak down under. Of course, there will be a lot of drama. With Kim Clijsters hot off her surprising US Open win, and currently cruising through the Brisbane draw, I believe she will go far in the Sunny Slam. In Peter Bodo’s recent blog post, “Kim Time?” her superior physical conditioning is cited as one of her greatest assets on the court. This pure athleticism will certainly help at the Aussie Open, which is a real test of fitness when combined with the debilitating Australian heat. Bringing into question, would Serena have fended off Svetlana Kuznetzova at last year’s Australian Open without the interesting decision by tournament officials to close the roof? Anyway, I suspect Clijsters will make a brilliant showing, and continue her impressive form all the way to the semifinals. No post about the WTA Tour and a Grand Slam title at stake could forget the other Belgian champion on a comeback of her own, Justine Henin. With an improved serve, a beautiful one-handed backhand, and a recharged spirit, I believe Justine will go far at the tournament. Justine will be a dangerous floater in the tournament as an unranked player, and will likely upset numerous seeds on her way to the quarterfinals. Does she have the form to take out Serena or Clijsters? We’ll have to see. It certainly would not be a surprise given her 6 wins to 7 losses head-to-head against Serena, the last of those three wins coming at the French Open, Wimbledon, and US Open in 2007, and her 12 wins and 10 losses to Clijsters. There’s nothing stopping her from taking these rivalries to the next level. Predictions: Serena takes home her fifth Australian Open, breaking the curse in which she only wins the Slam every other year; Kim Clijsters outlasts and outhits her way to the semifinals / finals depending on the draw; and Justine Henin finds her way back to the top tier of competitive tennis, bowing out no earlier than the quarterfinals, making a splash, especially with her new serve, the whole way. Blackhorses: Although ranked two in the world,and coming off of an extremely successful year with her two Grand Slam finals, it is fitting that Dinara Safina appears only as a blackhorse in the competition. However, when she’s on her game, which hasn’t been for a while now, she’s always a threat at a Grand Slam. But, can she take it one step further without breaking down? The Dane, Caroline Wozniacki, is another person who deserves attention. With the confidence that comes from reaching a Slam Final, especially on the hardcourts, I believe Wozniacki will prove that she has what it takes at the Aussie Open, too. Plus, she’ll be looking for improvement after that difficult three set loss to home favorite Jelena Dokic last year. Finally, Maria Sharapova should not be discounted. It all depends on the shoulder because we all know she certainly has the spirit and fight to win against anyone, on any given day.